Marine protected areas (MPAs) are commonly used to protect marine species and their habitats. However, we still don’t fully know how effective MPAs are in protecting highly mobile species such as sharks, or how MPA protection compares to the threats these species face when they move out of the MPA boundaries. Large sharks are not naturally vulnerable animals. Take tiger sharks for example. They are the top predator of tropical seas and have very little to be concerned about (at least when they become large enough not to be eaten). They eat, they cruise, they breed – the natural perks of being a large tiger shark. The primary risk to tiger sharks comes from us, humans. From what we and other researchers observed so far, tiger shark movements at least in some locations can be described as showing high individual variability, ranging from regional patrols to long distance migrations. Tiger sharks have the ability to cover vast areas of the ocean. While at this stage we can guess the purpose (e.g. for reproduction, moving to better foraging grounds, or chasing optimal temperatures), we do know that these movements expose tiger sharks to a range of threats occurring 100s, if not 1000s of kilometers away. 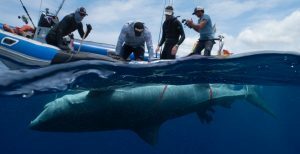 In our recent publication, we used satellite tracking (see our previous blog https://biopixelresearch.org/guide-tracking-tagging-part-3-3/) to investigate the level of protection afforded to southwest Indian Ocean tiger sharks by current MPAs compared to the threats they face when leaving the MPAs. 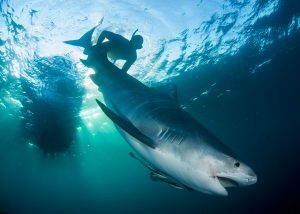 Over the past few years, we have been involved with South African collaborators https://www.facebook.com/pontasharkdiaries/ in satellite tagging tiger sharks within Marine Reserves in Mozambique and South Africa. 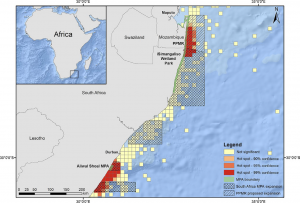 Two of these reserves, the Ponta do Ouro Partial Marine Reserve (PPMR) in Mozambique and the iSimangaliso Wetland Park (IWP) together make up one of Africa’s largest transnational MPAs, extending three nautical miles (5.5 km) offshore and covering over 360km of coastline (Figure 1). So, what man-made dangers do Mozambique/South African tiger sharks face in their likely large patrol area? Artisanal Fishing is vital to the coastal communities in Mozambique. This sector has no formal reporting system or enforcement, so while difficult to measure, the impact of artisanal fisheries within Mozambique is likely to be significant, with reports of up to 100,000 artisanal fishermen along the coast (http://www.iotc.org/documents/mozambique-fisheries). This sector is concentrated in near coastal waters with small boats and coastal fishing the primary platforms. This area is also utilised by many species of sharks and rays, including tiger sharks. Tiger sharks and other sharks and rays are used for meat, but the shark fin fishery is much more lucrative and is probably driving the expansion of this sector (Eyes on the Horizon www.eoth.org/). Offshore, industrial fisheries target tuna and sailfish using longlines, and sharks are taken as bycatch. The level of shark bycatch is again difficult to measure due to underreporting. 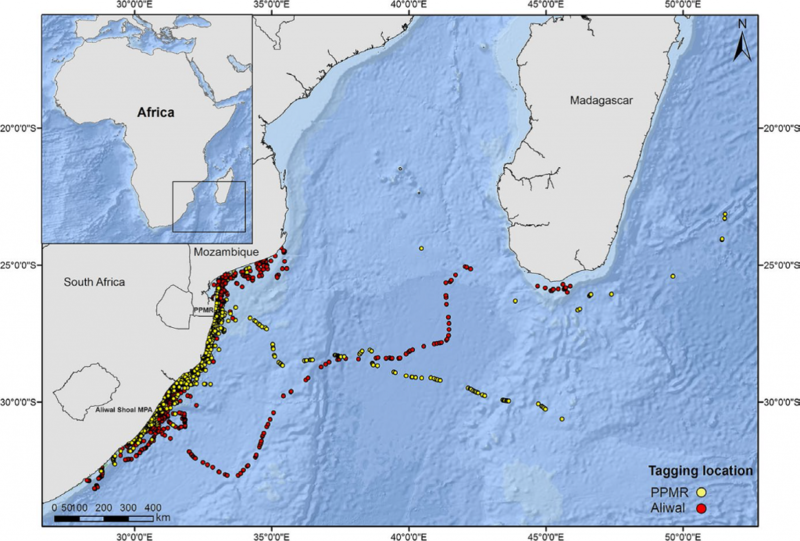 Dedicated offshore shark fin fishing by foreign fleets is known to occur in Mozambican waters. Fishing, direct and as bycatch, legal and illegal, are clear threats to our tigers and according to EOTH, the shark fisheries have grown in recent years (Pierce et al. 2008). However, the real extent of this threat remains unknown. Shark culling, or shark control, programs are designed to reduce the number of large sharks in a local area in an attempt to reduce the chances of unprovoked shark encounters. A shark culling programs exists on the east coast of South Africa. The KwaZulu-Natal Shark Program lies along the Natal coast of South Africa, starting at Richard’s Bay and stretching south for ~320km. The shark control program involves both nets and drumlines. On average, 51 tiger sharks are caught by the program each year. The KwaZulu-Natal shark program has been in place for decades. However La Reunion also has a program to reduce their bull and tiger shark numbers. That program includes the use of dedicated fishermen to kill bull and tiger sharks, along with the use of longlines and drumlines. Do you think it’s unlikely one of our tagged sharks could be killed in these ways? Think again. In October 2012, a young great white shark name Brenda, originally tagged by Ocearch in South Africa, was caught and killed in Mozambican waters. An immature, Ocearch-tagged great white, Madiba, was caught on a KwaZulu-Natal shark program drumline, less than a year after he was tagged (http://www.ocearch.org/profile/madiba/). Closer to home, one of the tiger sharks we tagged off Fraser Island in Australia was killed on a shark control drumline in Bundaberg. These are only a few examples of tagged sharks being caught in fisheries or culling programs around the world. 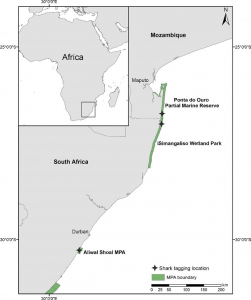 With this study, we used satellite transmitters to identify “hotspots” of tiger shark habitat use in the Southwest Indian Ocean and quantify the overlap of these core use areas with current and planned MPAs, and with the areas of risks from fishing and culling. 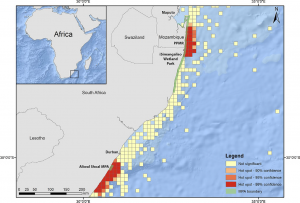 The study is timely given the plans to expand the South African MPA network through “operation Phakisa” (South African Government Gazette 10553), part of a broad socioeconomic national development plan which in part aims to increase the protected area coverage within the country’s exclusive economic zone. Our results show that only 6% of the tiger shark hotspots (i.e. areas most used by tiger sharks) overlap with current MPAs in South Africa/Mozambique (see movements in Figure 2, and hot spots of tiger sharks in red in Figure 3). However, if the plans to expand the South African MPA network go ahead, this protection will increase to include 24% of their most used areas (Figure 4). If Mozambique increased their protected boundaries in a similar way, that protection would increase to as much as 42%! (Figure 5). Although tiger sharks remained largely coastal, there was only a small spatial overlap of 5% with the shark culling nets in South Africa. Only three sharks undertook open ocean migrations during which they were more likely to interact with longline fisheries in the region. This study demonstrates how spatial information for highly mobile species can be used to design marine protected areas that incorporate a significantly higher proportion of their core habitats and highlights how congruent transnational conservation management can improve the effectiveness of protected areas. Pierce, S. J., Trerup, M., Williams, C., Tilley, A., Marshall, A. D., Raba, N. (2008) Shark fishing in Mozambique: A preliminary assessment of artisanal fisheries. Eyes on the Horizon, Maputo.